Clinic Synopsis: Eurus Saxophone Quartet is comprised of Houston area educators committed to "teaching by doing," (a teacher’s continued study of music through performance), particularly in the formative years of one's career. We will discuss many aspects of our experiences, offer advice for the challenges facing educators seeking similar projects, and the impact that our quartet and community band involvement has made on our students. Clinician Biographical Information Kaylee Christensen serves as Associate Band Director at Cypress Springs High School in Cypress- Fairbanks ISD. Her duties include directing the jazz program, conducting the Symphonic Winds, assisting with the marching program, coordinating the chamber music program, and teaching all woodwind classes. 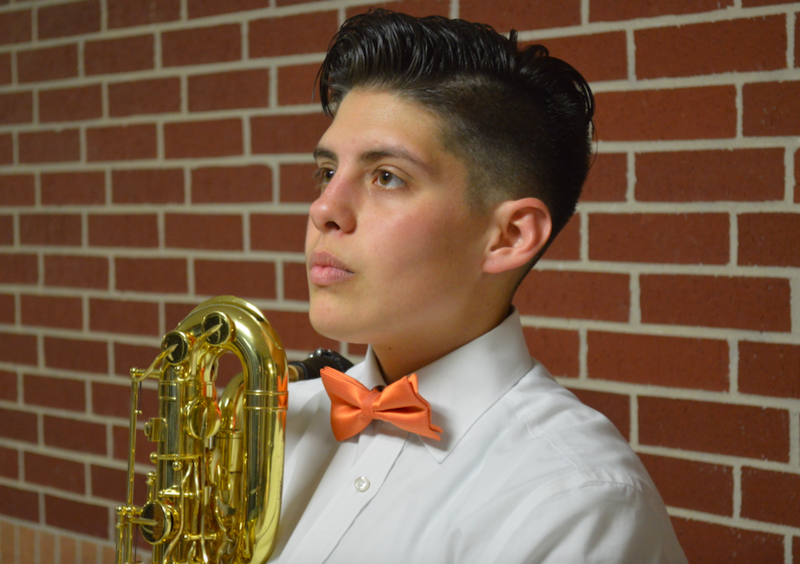 She is the baritone saxophonist in the Eurus Saxophone Quartet as well as an alto saxophonist in the Lone Star Symphonic Band. Prior to her appointment at Cypress Springs, Christensen completed her MM in Conducting at Oklahoma State University. Under her direction, the Oklahoma State Saxophone Octet was accepted to perform at the North American Saxophone Alliance National Conference and the 2016 Midwest Clinic in Chicago. As a performer, Christensen has participated in many chamber and large ensembles throughout her educational periods and was a member of Indarra Quartet- the 2016 Music Teacher’s National Association (MTNA) Chamber Music Competition’s national 2nd place winner as well as the Kwadrat Quartet- a 2011 MTNA Chamber Music Competition national finalist. Prior to her Masters degree, Christensen completed a BM in Music Education at Oklahoma State University, where she studied saxophone with Dr. Jeffrey Loeffert. Reese Burgan is Adjunct Professor of Saxophone at Lone Star College - Montgomery and Lone Star College - North Harris, where he is an active performer and avid teacher of saxophone and music theory and director of the annual Montgomery Saxophone Day. His performing career has taken him around North America, performing in venues spanning the United States to Canada, and he is a founding ensemble member of both Ikigaioto Duo and Eurus Saxophone Quartet. Currently, Reese is Site Coordinator for the Young Saxophonist's Institute, an annual summer camp for middle school and high school saxophonists with location across Houstona and Dallas. He is also Co-Organizer of The Woodlands Chamber Music Project, which is an emerging organization in north Houston seeking to bring audiences and professional musicians together for a monthly recital series, as well as curate performance opportunities for young musicians outside of traditional academic settings. Reese holds a Master of Music degree from Georgia State University and has studied with Dr. Jan Berry Baker, Dr. Masahito Sugihara, Dr. Scott Plugge, and Mr. Seth McAdow. Third Clinician Biographical Information Hayden Anderson currently serves as Assistant Director of Bands at Cook Middle School in Cypress-Fairbanks ISD. His responsibilities include teaching the Concert Winds, Concert Band, Beginning Low Brass, Trombone, and Saxophone classes, and he assists with the Symphonic Winds and Symphonic Band. Prior to teaching, Anderson earned a BM in Music Education from Oklahoma State University. While at OSU he was an active performer; most notably as a member of the OSU Saxophone Octet (2016 Midwest Clinic), the OSU Wind Ensemble (2017 National CBDNA National Conference), the OSU Jazz Orchestra (on their inaugural CD Solid Gold), as well as performing both nationally and internationally in various chamber ensembles. He studied saxophone under Jeffrey Loeffert, Kimberly Goddard Loeffert, and Tommy Poole. His music education teachers include Douglas Henderson, Marc Sosnowchik, and Benjamin Lorenzo. As a lifelong learner, he has attended various professional development conferences and clinics such as; TBA, TMEA, CSI, SMU Art of Teaching Music, and the Midwest Clinic. Mr. Anderson’s professional affiliations includes Texas Music Educators Association, Texas Bandmasters Association and North American Saxophone Alliance. Fourth Clinician Biographical Information Andrew Twiss currently serves as the Assistant Director of Bands at Huntsville High School, where he conducts the Symphonic Band and the Swingin' Stingers Jazz Ensemble. He comes to the Huntsville band program from Tulsa, Oklahoma, where he graduated from Oklahoma State University with a Bachelor's degree in Music Education. During his time at Oklahoma State University, Mr. Twiss was a National Chamber Music Finalist in the Music Teacher's National Association Competition, and a drum major for the Oklahoma State Cowboy Marching Band. Through his experience with the OSU jazz program, Mr. Twiss has performed with acclaimed artists such as Stockton Helbing, Christian McBride, and Wycliffe Gordon. Andrew is the tenor saxophonist in the Eurus Saxophone Quartet.